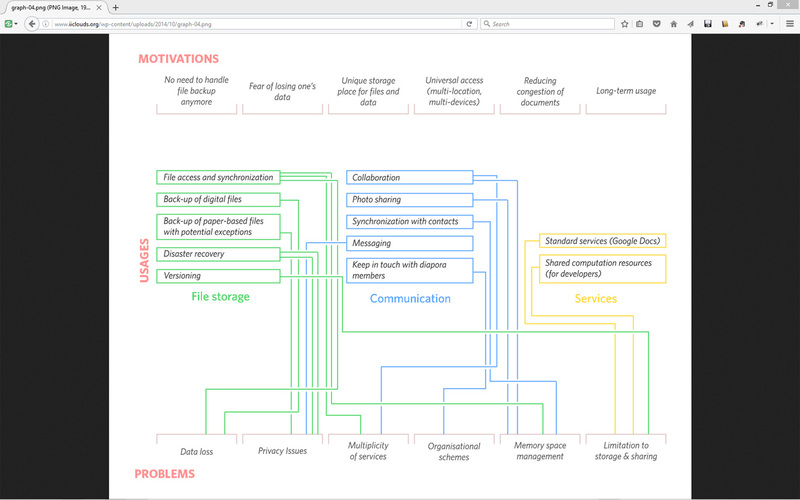 As already stated in previous drawings, cloud usages scheme and overall scenario sketches, each of the five folders contained in “A Personal Cloud” will encapsulate and automate specific behaviors related to “cloud computing” (third party computation, distant data handling and file storage or management). Some cascade of events and file transfers might even happen. As we can see, the focus as been set on the interaction rather than the visual interface. Especially as our research drove us in the direction of physical interaction, a line of work which became the project “My Data Controllers”. Corresponds to the regular storage function of the cloud, like to keep or to store files (“motivations”). Unless this folder is connected with its counterpart physical object from “My Data Controllers“, nothing particular happens to the contained files and the usual function of the cloud is not modified or improved. If it is indeed connected, then all files could be suddenly deleted if a special action is taken, files and data could literally be “vanished!” (“problems”). Matches user’s desire to protect its files in an automated way (“motivations”). Therefore to backup or to privatize: each file placed in this folder is automatically backuped and privatized. If the folder is connected with its physical counterpart, its files could be un-backuped, “neglected!” and them moved into the TO_MULTIPLY folder (“problems”). When a user wishes to keep a file or some data “forever”, he places it in this folder (“motivations”). It can be understood as to compress, to “zip” or to store files endlessly. When linked to its physical interface and not paid attention to, files can be uncompressed, “melted!” and then move into the “TO_ACCUMULATE” folder, where they might then end deleted (“problems”). It is a more random and possibly surprising process. Files being placed in this folder will be almost arbitrarily transformed by algorithms according to their types (text, image, sound files). Corresponds to the user’s desire to make copies of its own files on many other devices (to universalize) or to share them with others persons (“motivations”). Only in this case the process is pushed to its limit: all the files in this folder are being automatically shared with other users that are also federated to “A Personal Cloud”. Files deleted by a user somewhere will be deleted everywhere in the cloud and for all users (“problems”). Next steps in development will be to further test the interaction and fine tune it without adding too much complexity to the system. We’re trying not to add another layer (like for example another client-server that would keep track of the status of this and that in the cloud), which might force us to drop some options.